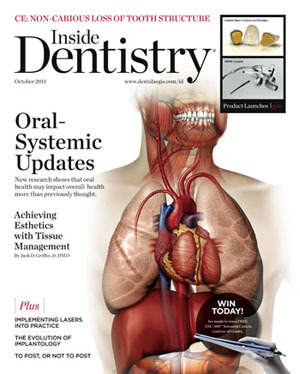 I found this article in Inside Dentistry October 2011 and thought it was too good not to share! According to our recently published study in the May/June issue of General Dentistry, burning mouth syndrome (BMS) may be related to nerve damage during menopause. The study indicated that nearly 5% of Americans experience the symptoms of BMS, a burning sensation on the roof of the mouth and the tongue, and that menopausal and post-menopausal women are most likely to be affected 7:1. We attributed this statistic to the fact that hormonal changes during menopause can result in BMS and also affect pain perception in women. Due to the lack of physical symptoms, many study participants suffered from BMS for many years without being diagnosed. The most startling fact revealed in the research is the time lag for these individuals who suffer with burning mouth syndrome between the initial onset of a burning sensation in their mouths to the time it was definitively diagnosed, which was a mean of 41 months. Considering these individuals saw multiple healthcare practitioners, were prescribed medications—some appropriate for the treatment of burning mouth syndrome and some totally inappropriate—you can understand the frustration they must have been feeling with the healthcare community. Certainly BMS is a diagnosis of exclusion. People present with oral burning sensations, and it is up to the practitioner to determine why they have them. First, local factors must be ruled out, then systemic factors, and, finally, potentially psychological factors and maybe certain selective medications that may be implicated in causing burning mouth. Once all of those factors are ruled out, then a diagnosis of primary BMS—for which no etiological reason is found—can be made. A diagnosis of secondary BMS is attributed to when there is an etiological reason for the burning, such as systemic factors like menopause. We do not know what causes BMS, but we do have some theories that might explain why individuals have it. One of the startling facts that we see in BMS is that it seems to be a female-dominated condition. The ratio of women to men suffering from BMS can be anywhere from 7:1. It also seems to be a perimenopausal disorder, where most of the individuals who complain about BMS seem to be in the age range of 3 years prior to menopause, up to 12 years post-menopause. So clearly there is a menopausal component to this. It seems that BMS may follow damage to taste, suggesting a taste/BMS interaction. Anything that causes damage to taste may in fact cause BMS and one of the potential factors damaging taste is a decrease in estrogen levels, which is associated with menopause. Taste is served by three cranial nerves (ie, 7, 9, and 10), and if there is some taste damage in those nerves, that sometimes can precipitate a loss of inhibition in cranial nerve 5, which is important for a pain sensation. So, the mechanism for BMS may very well be a neuropathic condition caused by miscommunication between the nerves and brain that results in a failure to turn off the oral pain receptors. Because the receptors do not turn off, BMS sufferers experience a burning sensation, a dry and gritty feeling in the mouth, and a change in taste. We’re still in our infancy in understanding this syndrome. We label anybody who fits the criteria of what one considers primary burning mouth syndrome, but there are several subgroups of BMS and several theories as to why somebody has it. What is needed is a very large database to start phasing out the various categories of the subgroups in the field of BMS in order to understand the etiology and pathophysiological processes that do not fit the overall domain of BMS but maybe explain the different subcategories. If we can explain the different subcategories, then maybe we can begin targeting our interventions, rather than using a shotgun approach.